I'm so excited to welcome my friend Lorene for this Saturday's stocking stuffer idea. 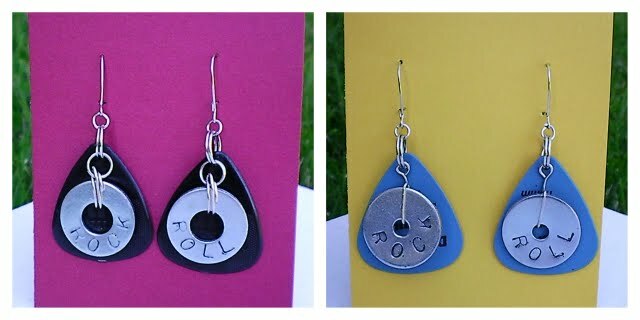 AND she's giving two of you the opportunity to win these super cool rock and roll washer earrings. Check out ways to enter at the end of the post. Happy Saturday! I am so happy to be here with you today. 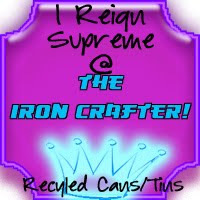 I idolize Elizabeth and love all of her twelve (plus some) crafts, so I feel like a celebrity today! And just who am I? just Lu is my place to be just who I am: a wife, mommy, and technical writer who is also slightly addicted to creating. I share mostly crafts with a few recipes and other tidbits, and on Wednesdays I post web savvy tips and tricks over at my real-life best friend Debra's blog, Housewife Eclectic. I'd love to have you stop by sometime! Today I am so thrilled to share with you one of my favorite and easiest projects: rock and roll earrings. 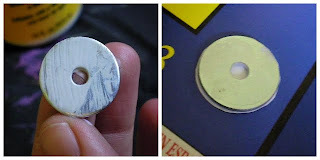 I got in on the stamped washer craze at the beginning of summer, just like every other craft blogger. I was inspired by Polly's stamped washer earrings at Helping Little Hands, but after I made mine, I felt they they were just needing a little something extra. For me, that little something was a cheap piece of plastic otherwise known as a guitar pick. Each pair of earrings ends up costing under $2, but it's practically impossible to find most of these supplies in small quantities (less than 36), so get a group of friends together or mass produce to make the most of your supplies. I bought my jewelry supplies at the local craft store as part of a kit, but you can buy them separately, too. 2 earring backs -- anything but posts will work. I use either fishhook (lower) or kidney wire (upper) backs, both pictured. about 8 jump rings (you may want more just in case) in three different sizes -- I use 4 large (about 8 mm), 2 medium (about 6 mm) and two small (about 4 mm). I prefer the rings that look like little keyrings instead of the single-loop ones, but they both work great. 2 eye pins -- optional, but can replace four of the jump rings. I prefer using eye pins instead of jump rings, especially with the thicker fender washers (explained below). 2 guitar picks -- I buy mine three for a buck at my local music shop (and I do pay for them even though they say "Stolen from..."), but you can also find some awesome and inexpensive multipacks online if you don't have a local store near you. Don't worry about the thickness (such as .8 mm) too much -- just find a color/pattern that you love. 2 flat washers -- I use 1/4 inch washers, and they are just the right size and weight. The washers pictured are regular washers (larger hole, on the right) and fender washers (smaller hole, on the left). *Wet wipes -- just one or two (not pictured). Any kind of wet wipe will work -- baby wipes, disinfectant wipes, or even a paper towel with a bit of rubbing alcohol or vinegar on it (just barely damp). *A steel stamp kit -- I use this 36 piece 1/8" set from Harbor Freight. If you're only going haute couture, you won't need this, the permanent marker, wet wipes, or heavy hammer. Needle-nosed pliers/wire cutters -- I used regular ones straight from my tool kit before finally breaking down and spending the $5 to get a 3-in-1 jewelry tool. The jewelry tool has a smaller tip and doesn't leave grooves on the wire after I bend it, and I've made a lot of these earrings (plus a few other jewelry items) so they were definitely worth the purchase. An awl or other hole-creating device -- An awl is just a small pointed piece of metal with a handle. You could probably use a drill, but I was afraid that the drill would crack the pick, so I borrowed (possibly permanently) my dad's ancient awl. The ancientness is optional; you can pick a new one up for a couple bucks at your local hardware store. A clear glaze, like Glossy Accents, Diamond Glaze or Dimensional ModPodge -- you can use your regular Mod Podge, but it doesn't seal as well or look as snazzy. Your glaze needs to be clear (of course), dry to a hard finish, and have an easy-apply fine tip bottle (trust me, you'll want that!). 1. Find a hard flat surface. I used my concrete front step with my thin plastic cutting board (actually a $1 store placemat) to protect the back of the washer. 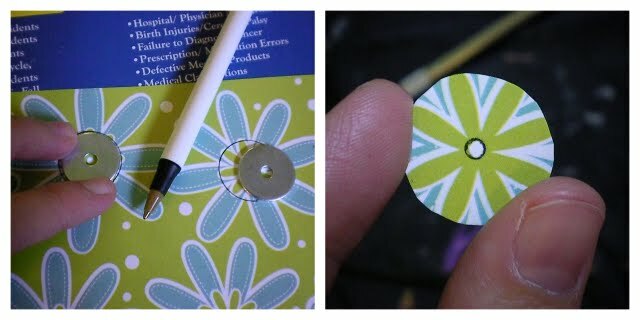 You could also use a self-healing mat from a rotary cutter if you want. 2. Place your washer on your covered surface and place your stamp on top of it. Be sure that your stamp is FLAT -- rock it up and down (away from you and then back towards you and then left and right) until you've got a good feeling for where "flat" is. If your stamp isn't flat, you'll get an uneven stamp and possibly miss part of a letter, resulting in an R that looks like a P. And who wants to pock and poll? Nope, everyone wants to rock and roll. 4. Stamp each letter until your washers say what you want them to say. Rock and Roll are only suggestions and the namesake of the earrings. I'd love to see what you choose to stamp! 6. Wipe off the permanent marker with your wet wipes. This will leave behind just the ink that is down in the stamp impression and make the stamped letters easier to read. 2. Apply a thin layer of ModPodge to the front of the washers and firmly press your washer on to the back side of your paper circles. 3. When the ModPodge has dried completely, use your Xacto knife to trim away the excess paper and cut out the center hole of each washer. 4. Lightly sand the outer edges with your emery board and smooth the center edges with your Xacto knife so all the edges are nice and trim. 5. Brush away any paper scraps or sandy residue and apply a thin layer of glaze over the paper on each washer. Use the fine-tipped applicator to be sure that the glaze covers the entire surface of the paper and resist the urge to shake the bottle. Shaking the bottle will put yucky bubbles in your glaze. You can also just use a couple more coats of ModPodge, but it won't seal out moisture quite as well or look as glazey and polished. 6. Allow the glaze to dry completely. You want that glaze dry and chisel-hard. My glaze recommended an hour, but after an hour, it was dry to touch but still too soft so my washer ended up with some yucky marks on it. I'd recommend at least 4 hours, overnight if possible. 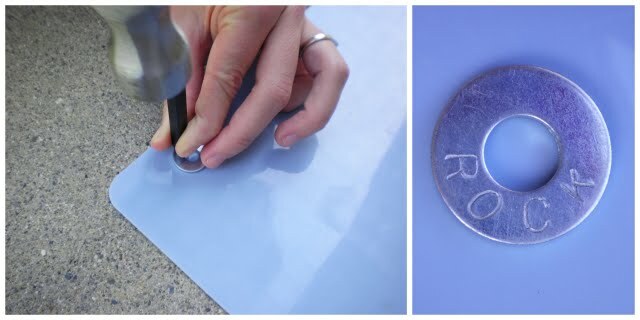 For a look somewhere in between haute couture and classic rock, you could also use nail polish to decorate your washers like Michelle from A Little Tipsy shows here on UCreate. Once your washers are prettyfied (and completely dried if you glazed them), you'll make them into charms so they're ready to attach to the main earring body when you make it here in a bit. For this tutorial, I used two jump rings on the traditional washers and the eye pin on the fender washers, since my jump rings aren't big enough to wrap around the fender washers. When all is said and done, I prefer using a single eye pin because I find it simpler, both for attaching the washer to the earring and for adding a bead. I'll show you both ways so you can decide for yourself. 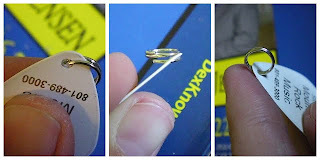 and if you're using a single-loop ring, you'll open it like pictured (by twisting the ring to separate the ends, not by pulling the ring to make an oval shape), thread it on, and then use your pliers to bring the ends closed again. 2. Attach a single medium jump ring to your large jump ring. 3. 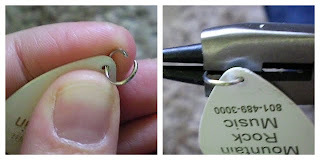 Thread your bead charm (if applicable) on to the large jump ring. 3. If you're adding a bead, slide the bead on the straight end of the pin. 4. Thread the pin through the hole in your washer so that the eye part of the pin is behind the washer and the bead (if applicable) and straight part of the eye pin are in front of the washer. 5. Bend the straight end of the pin around the washer so it is perpendicular(ish) to the eye end of the pin. 6. Trim the pin using your wire cutters and bend and flatten the wire tail. If you are using only jump rings (no eye pins -- explanation above in the Make the Washer Charms section), you'll need to make your charms separately. If you're using eye pins, the section above explains how to attach your bead as you create your washer charms. 1. String one bead on one head pin. 2. 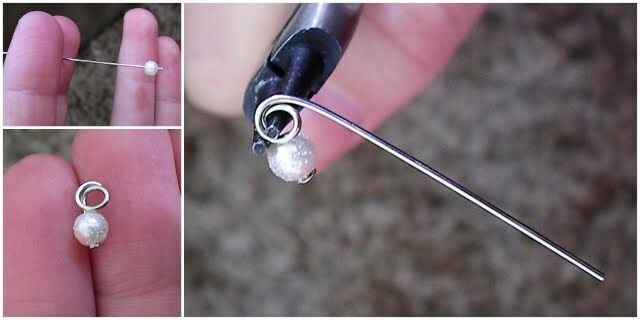 With your pliers, grip the pin just above the bead and twist the pin around the tip of the pliers until you've made at least a full circle. I make a circle and a half to be safe. 3. Using the wire cutters, trim the pin and then bend the wire tail so that it continues the circle and makes a nice little charm. Now that you've done your prep work, you're ready to build the earrings! 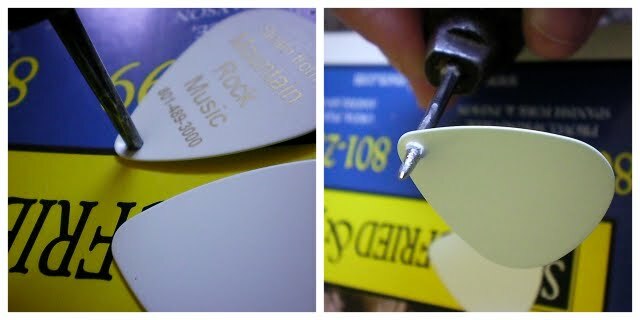 Before you start, though, decide what side of the guitar pick you want to be the front of the earring. 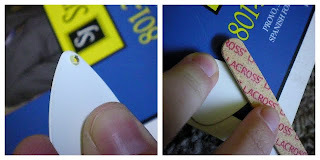 Most picks have writing on at least one side of the washer, so you can choose to let that show more on the front, or hide it on the back (and you can even cover it up with your pretty paper like you covered your haute couture washers if you want). 2. Press straight down and twist the awl carefully until you've pushed the awl completely through the pick and formed a nice hole. Then carefully remove the awl and admire the hole. :) Be sure that the hole is big enough to thread your jump ring through easily, especially if you are using the keyring-esque jump rings. 3. Grab your emery board and file off the little rim of extra plastic on the back side of the pick. You want that to be as flat as possible to make it easy for you to thread your jump rings through. 4. Repeat the hole-making process for the other pick. 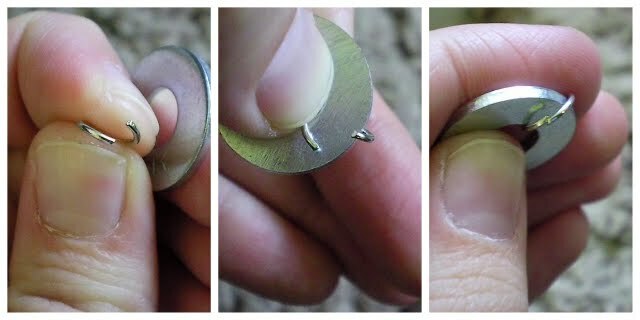 splitting the ring to slide it on, and then angling it so that the tip goes through the hole and continuing to slide it around until it is attached. 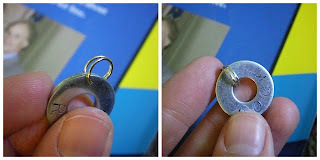 If you are using the single-loop rings, open the ring like shown (by twisting the ring to separate the ends, not by pulling the ring to make an oval shape), slide it through the hole, and clamp the ring back together. 6. Attach a small jump ring to the large jump ring on each pick. 7. Attach the small jump ring on each pick to your earring backs, making sure that the front of your pick is facing forwards. 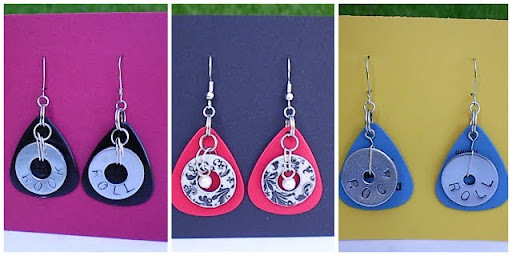 To make the nice earring display card, cut a 2.5x3 inch cardstock rectangle. Using a pin, poke two holes, each about half an inch from the top of the rectangle, one 3/4 inch (or so) from each side. 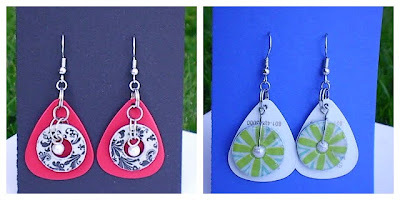 (For kidney wire earrings, poke two extra holes about half an inch below those holes for the little hook part.) Load your earrings on your card and gift away! Another entry: Give me a suggestion of what to stamp on the washers for earrings, and let me know which pair of earrings your like best. I stick with rock and roll because I'm fresh out of ideas, so I need your help! 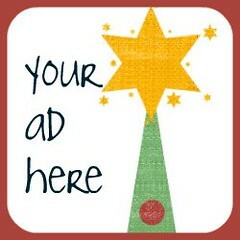 Another entry: Spread the word on Facebook, Twitter, or your blog. Roll with the punches is too long....You could personalize it with initials if the people in your family....which is somewhat symbolic, sorda like the wedding band. I love the hot pink ones.. cute!! I truly can't decide between the black rock and roll and the red haut couture ones. They're both awesome! Thanks for the great tutorial. I'm very tempted to go out and buy some washers today. I was going to say "Heart & Soul" like Isabel did. :o) Thanks for sharing. Happy Saturday! Great Gatsby, those are awesome! I am a follower of both blogs. I like the red ones. Cute for Christmas would be "ho ho ho" or to stick with a holiday them you could do "boo" on each of them. I love the classic black. and the haute red...oh I love them all. Great tutorial, Lorene! Already a big fan/follower of yours! 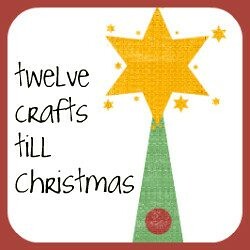 And now I follow twelve crafts till Christmas, too! Love, love, love these! I follow twelve crafts till Christmas. This is great! My son plays in a christian youth band and the girls would go wild over these! I think I may be wild myself... :) How neat! I am a new follower!!! I am now a follower of Lu! Love the blog!! I am a just Lu Follower! I love the haute red earings the best!! Another stamp idea? Maybe musical notes. These are so incredibly creative! They would make a great Christmas present for my niece who is learning to play guitar. Another stamp idea might be Praise & Worship. Wooohooo! I know just who to make these for! Sweet. :) I'd love to win a set though for ME. haha. I'm a follower! I kind of like pock and poll but I think I'll stick with rock and roll for my friend. Maybe for me I'd stamp right and left. Just for kicks. ;) I think I like the classic black set best - though the haute red are pretty yummy.